Digital Signage software, or more commonly known as Digital Signage Content Management System (CMS), is the mechanism through which the content of a Digital Signage screens can be updated and managed. In a more broad sense the term “Digital Signage software” can refer to the method in which Digital Signage displays are updated. Digital Signage software allows users to manage Digital Signage displays in the easiest way possible. A CMS lets users manage Digital Signage content. From creating multi zone templates with images, videos and even webzones in one display to using bespoke widgets such as the time and date to even the weather forecast to finish off your content. Users can deploy content to multiple screens anywhere in the world via the web by using this kind of cloud based CMS. Content is just one side to the CMS though, managing the screen is another aspect. Digital Signage software should allow users to see what is displaying on your network of screens at any time with comprehensive publishing logs. User management will allow administrators to restrict and allow certain features to certain users for a more secure software solution. 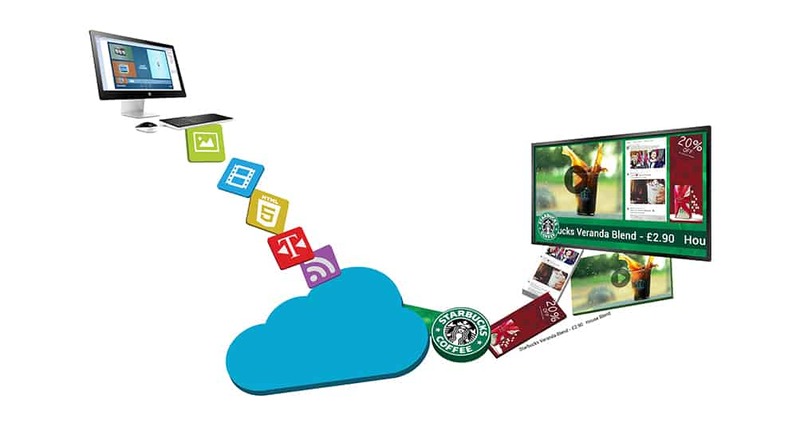 This kind of solution is contingent on the Digital Signage screen being connected to the internet. If a screen is not connected to the internet there is still software that can help users manage their displays with uploading content via a plug and play USB update method. A quick google search for Digital Signage software will bring up pages and pages of results. The market is flooded with software solutions all claiming to offer the best features. A lot of this is just hyperbole with little meaning. Most commercial Digital Signage displays will come with their own kind of Digital Signage software or CMS. Is there really a necessity to bring a third party software into the mix? If something goes wrong with Digital Signage it is usually the screen itself or the software. By bringing in third party software there is more cause for confusion if something goes awry. If you source the screen and software from one supplier the whole process is a lot easier if something goes wrong. What Screens Can Digital Signage Software Run On? Digital Signage software can run on most Digital Signage displays. Some providers make their solution open to everyone while those that focus on all-in-one solutions tend to make their software bespoke for their displays like our Network Android Advertising Displays. There is no size limit with 10” POS Advertising Displays up to 86” Professional Monitors being able to run the exact same software. Media Players are the key to unlocking software solutions as they can turn basically any display into a Digital Signage screen such as LCD Video Walls. A touch screen CMS is available for Touch Screens that performs all of the same functions as the Network CMS but with the ability to create interactive Touch playlists. If you would like to request a free trial version of our CMS please email us at trial@allsee-tech.com.